The house the Hagmans built is a grand Mediterranean-style residence sited atop Ojai’s picturesque Sulphur Mountain Road with commanding views of the ocean, Channel Islands, mountains, and surrounding Ventura Valley. Encompassing approximately 18,000 square feet, with nine bedrooms, 13 full and two half bathrooms, Heaven features richly appointed open living spaces with large spans of sliding glass walls that offer unobstructed vistas of the surrounding landscape. With views like this from the bedroom, I wouldn’t mind waking up each morning! 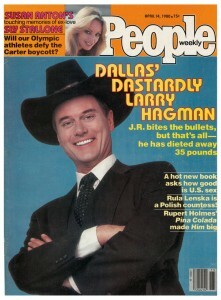 Here’s a People cover from 1980 when “Dallas” was must-see TV. J.R. wore a black hat better than anyone! Thank you for the tour! I never got hooked on another show the way I was with “Dallas”! We would all watch together each week. You’ve gotta love that Larry Hagaman-I also did on “Jeannie”-one of my favorite childhood shows. I watched “Parenthood” this week and I think I only paid attention to the house and paint colors! .-= Nancy´s last blog ..Stuffed Peppers for Foodie Friday =-. This may seem a little odd, but compared to many other estates on the market right now “Heaven” sounds like a bargain. I believe there was a Living with Ed episode where they went to the Hagman property. Great post, Julia. That house looks AMAZING. 43 acres and that view from the bedroom?! Wow. Of course I grew up watching the Ewings, living in Dallas. But I hate the reputation it gave our cities overseas. I swear, people visit here the first time and ask where our horses and tumbleweeds are. OY. That property is beautiful. The surrounding land is breathtaking! It is awesome that it is solar powered. .-= Pam @ Design Fanatic´s last blog ..MIRROR MAKEOVER =-. What a beautiful house and property! That bedroom view is amazing, not only to wake up to, but to fall asleep with. .-= Janell Beals´s last blog ..Max Shares His Thoughts On Design =-. What a cool house. It always amazes me to see these big of homes and people are actually living in them. .-= Amy @ Living Locurto´s last blog ..Sweet Fairy Party =-. What I would give for those big windowed views. Amazing. I was also impressed that he uses solar energy – something we have entertained with this big old rambler of ours. Thanks for the fun post. .-= Marija´s last blog ..Mon. Morning Distraction #4 =-. Never was a Dallas watcher, but oh, how I loved I Dream of Jeanie! Major Nelson was a heart-throb! .-= Richella at Imparting Grace´s last blog ..This Tuesday =-. Can you imagine?? I would just lay there for hours:) Very dreamy! .-= Becky @ Farmgirl Paints´s last blog ..This little light of mine:) =-. Wow, looking at that old People Magazine cover sure messes with my perspective. I was just a kid when Dallas was popular, and I remember thinking JR was an old guy. Like a family patriarch (I never actually watched the show but the commercials and magazine covers were everywhere). I see the cover now and marvel at how young he was! I guess age’ll do that to you?! .-= Pink Martini´s last blog ..O’reo Patties For St. Patty’s Day =-. Not only a beautiful property, but eco-friendly as well! Way to go Larry Hagman! Watching the video, I actually had to listen to this twice just to make sure I heard him right: After installing the solar panels our electricity bills “went from $37,000 to $13 a year and now we are generating a surplus of $10,000 a year.” What a testament to alternative energy! Thanks for the great look at this home! Loved the post. I loved that outdoor patio area on Dallas, with the yellow cushioned furniture. I am a nut for yellow, tho. It is reminds me a bit of the yellow tole painted, early american funiture that Gable and Lombard had on their porch in Encino, those many years ago. Must be tough leaving “heaven” to downsize. I’m sure they will still have a fab home when they do downsize! I love the views..how wonderful to look out your window and take in all of the beauty around you! I always like those scenes on Dallas when they sat under that stripped awning and had their coffee, now I sit under my stripped awning (white and taupe) and have my coffee..but not on a ranch, just a suburban back yard, but just as sweet- maybe even sweeter, no one is shooting any one here! Ha! .-= Pat´s last blog ..The Sum Of Me =-. *It’s * just * too * big*!! I remember that covered porch from the show – loved seeing that he had something similar in his own home. I chuckled when I read your crush – me too! I loved Dallas! I miss it and Knots Landing:) I remember the covered porch as soon as I saw it on the photo. Brings back memories. .-= Melanie´s last blog ..Prairie Dust made me bite the dust! =-. I loved that show until the ‘shower’ scene and then it just got a little too way out there for me to enjoy. The first few years, though, found me clued to the tube to see what dastardly deed JR would be up to and to see how Bobby and Pam would be in love but not mushy about it. Great soap opera at night 🙂 Thanks for sharing this! I’d be interested to see what they buy next! And one other thought – could you do your ‘research’ and show us what the Ewings home looked like compared to what it really looks like?! .-= Nancy Hood´s last blog ..Garage Door Covers =-. Sorry I wouldn’t want this house. It’s too big and not my style. Even if I was rich, I wouldn’t want to buy a home in California. It seems like most of the houses I see forsale in California, and look at online, just aren’t that great or a “wow” for me. That’s why I wouldn’t want to live there. If I had to live n California, I would build a house. The house is amazing I’m sure it will sell, heaven is the right name for this house everyone needs their own piece of heaven. Dallas is my most favorite show i grew up watching i watch all the reruns and Larry was my favorite i always looked forward to seeing him on the show he is a natural born actor, what a great talent he has and he clearly enjoyed acting it showed. The cast was great also. Dallas will always have a special place in my heart. How much did it cost to install the solar panels ? If it were inexpensive EVERYONE would be doing it. Take the cost & divide the savings & that will give you the number of years it will cost to recoup those costs. Major Nelson! I was obsessed with those reruns! I think Jeanie’s bottle was the first interior I fell in love with…Morrocan inspired round banquette with throw pillows…getting off topic. You find the best stuff. As to the cost, to further on Jackie W.’s comment, we looked into adding solar panels to our home, and she was right. We calculated that we would need to live here for another 20 years to recoup the cost. But his home is really great! .-= The Zhush´s last blog ..Thank You Bill Cunningham! =-. .-= Robin´s last blog ..Getting better and how about more tea! =-. I really like that home – quite masculine, but in a nice way! WOW, I really specially enjoyed this post, love the movie…we all grwe up with Larry as JR, didn’t we…. .-= Ariadone´s last blog ..Statement … =-. wow that room with all the windows! I hope they tint or have blinds or you will be up at sunrise in the morning!!!! lol But that view is breathtaking! He said the solar panels cost $750,000.00 so he will get his investment back in 50 years or so. Beautiful home and land. Compared to several other homes of stars a very reasonable price. What a gorgeous blog with so much research and such great photos. Ok I will take it! Oh ya don’t have the cash.. darn it! Oh to spend a day on that patio! BTW- thanks for following my blog! .-= Pam Fitz´s last blog ..Bedtime Prayer Wall =-. @ Kim, not all houses in California look like this. California is rich in architectural diversity. But I wouldn’t want to live in this. It’s not at all right for me. Too big and too far out of the city. .-= Why S?´s last blog ..Local News =-. What a marvellous house! The house would be a fantastic place for a christianity work to give a peaceful place to people who needs to recover from their traumatic incidents. The will of the Lord be done in Jesus name. Amen!